Galactic Star-Lord: Remember that time you got shot into space and almost died? This'll keep you alive next time, and you'll still be able to hit stuff. Galactic Gamora: I'm the deadliest woman in the galaxy, but I confess I'm looking forward to being even more dangerous. 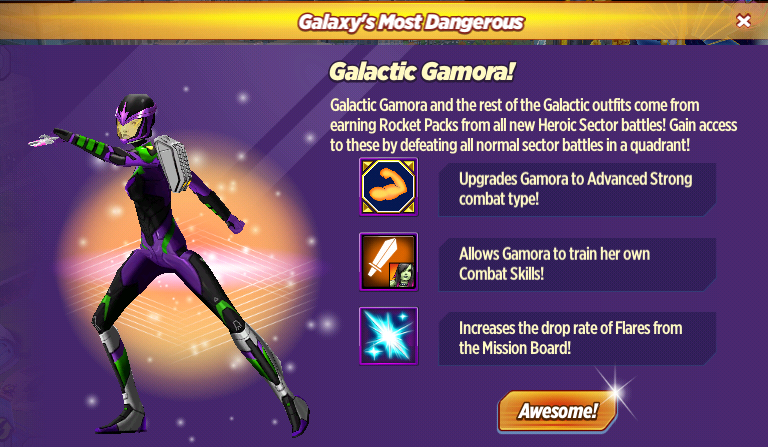 Galactic Star-Lord: Check out those rocket boots! 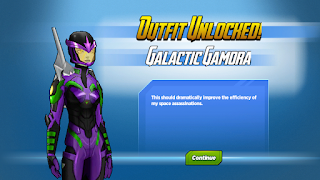 Galactic Gamora: I've already kicked a few people in the face. Black Widow: Does that suit protect you from the expanse of space? Galactic Gamora: Without it, the lack of air pressure would cause my body to swell up twice its size, and I wouldn't be able to hold my breath unless I wanted my lungs to explode. Black Widow: How many people have you kicked in the face with those rocket boots? 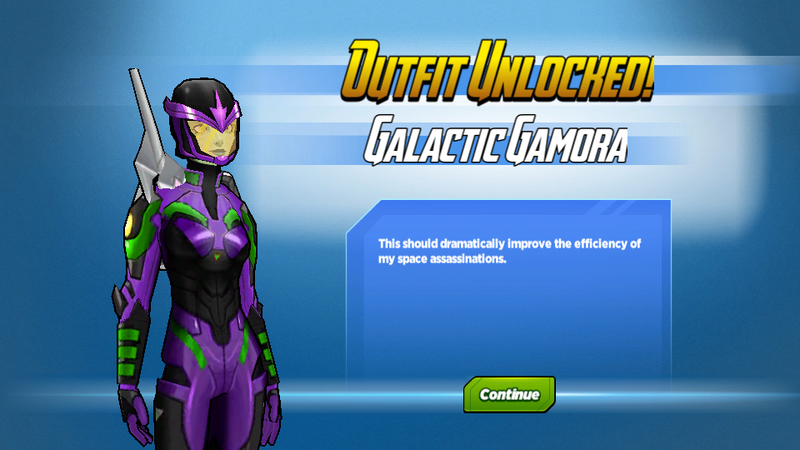 Galactic Gamora: I lost count. Iron Widow: What's the first thing you want to destroy with your suit? 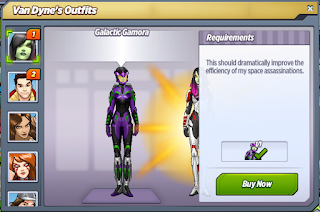 Galactic Gamora: Thanos, but training dummies are fine for now. Iron Widow: It's probably good to test it out before fighting someone called the Mad Titan. Galactic Gamora: Do I know you? Angela: No, but you clearly enjoy stabbing things with swords, so I feel like we should be friends. 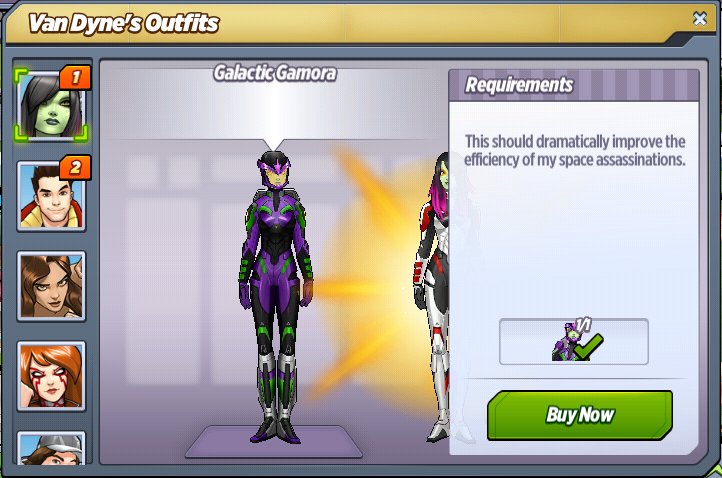 Galactic Gamora: This suit lets me fight the Priestesses of the Sovereign in space. Would you be interested in joining us? Angela: What are the Priestesses of the Sovereign? Galactic Gamora: Golden villainesses who must be destroyed. Rocket Raccoon: When do I get my sweet armor? Galactic Gamora: Talk to Director Fury. Rocket Raccoon: We're not getting along. Galactic Gamora: When are you ever getting along with anyone? Rocket Raccoon: You tryin' to say I'm not sociable?! Ayesha: I am here to cleanse the universe of your weakness. No suit of armor will make you more consequential in the face of my perfection. Galactic Gamora: Hey, no one knows cosmic indifference better than I do. I was exposed to the void of space without anything between it and me, and I survived. Ayesha: Apparently, both you and space are failures. 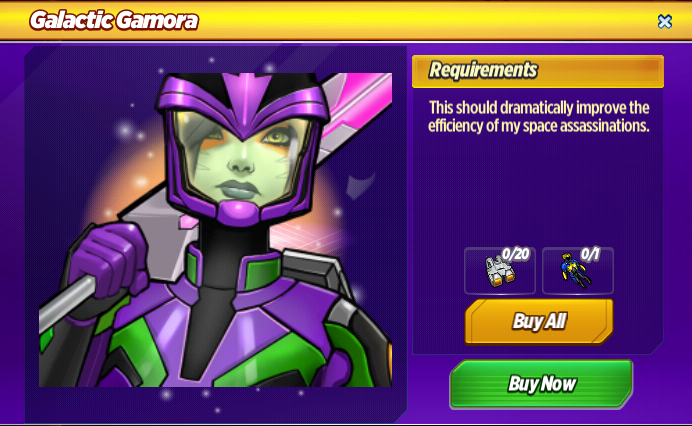 Galactic Gamora: Wow. You are making it really easy for me to want to kill you. Ayesha: You plan destroying us with the power of pyrotechnics? Galactic Gamora: I don't need anything to destroy you but my bare hands. This suit and my sword will just hasten the inevitable. Ayesha: I would love to see you try. Galactic Gamora: You will. And it will be the last thing you see. 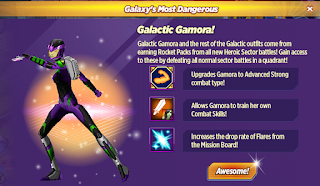 What do you think of Galactic Gamora? Were you able to get her?